Many Wisconsin lake communities work hard to keep their lakes healthy, but proximity to agriculture creates a major roadblock. They meet in the same small, faintly lit room each month in northern Wisconsin. Every time they meet they discuss her condition and what can be done to improve her health. Sometimes it’s little changes here and there, while other times she needs expensive procedures. In her case, the something-growing-where-it-shouldn’t-be is invasive weed species and harmful algae. Much like smoking and obesity can cause health problems in humans, agriculture and farming can cause serious health issues in lakes. Lakes throughout Wisconsin located in dense agricultural areas suffer from severe algae blooms in the summer because of high phosphorus levels. A major cause of these high levels is runoff from nearby farms. But the people who care about Little Green aren’t ready to give up even though treatment is expensive and results aren’t guaranteed. According to Steve Carpenter, director of the Center for Limnology at UW-Madison, these algae blooms are very difficult to handle. Little Green Lake is a small lake located about an hour north of Madison near the town of Green Lake. Her name was given to her years before the problem emerged, but now she looks even greener than before. This is due to the overwhelming presence of blue-green algae, or cyanobacteria, one of the side-effects of high phosphorus levels. Blue-green algae is most dangerous if humans, livestock or pets swallow the water it contaminates. “This type of algae can be toxic … it can make them sick or kill them,” Carpenter says. The most common cause of algae buildup starting in the 1880s was human sewage. Everyone dumped their sewage into the lake, according to Carpenter. Around the 1970s when Wisconsin established human sewage treatment, the sewage was diverted from the lakes. 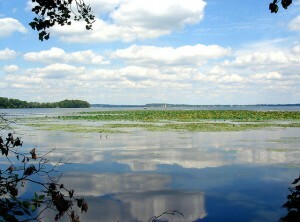 According to Little Green Lake’s 2011 Aquatic Plant Management Plan, Little Green’s watershed is 77 percent agriculture. Because of this, she often receives high amounts of the runoff from nearby farms, especially after heavy rain. For Little Green Lake, blue-green algae blooms were a major problem a decade ago, according to Gregg Cygnar, Little Green Lake Protection and Rehabilitation District committee chairman and lake homeowner. Cygnar owns a home on Little Green, right across the street from a large farm and on one of the most algae-ridden bays of the lake. Cygnar purchased his lake home in 1991, and a few years later, he feared he had made a terrible mistake. Another side effect of the excessive phosphorus levels from her condition is invasive weed species. According to Ted Johnson, a water resources management specialist for the Wisconsin Department of Natural Resources (DNR), the two most common invasive weed species present in Little Green are the Eurasian water milfoil and curly-leaf pondweed. Carpenter says Eurasian water milfoil typically causes the most harm because it grows to the top of the water surface and interferes with boating and fishing, which happen to be two main attractions that draw people to Little Green. But prevalent weed growth makes it very difficult for boats to maneuver through the water. According to Renee Braun, Little Green Lake Protection and Rehabilitation District secretary and lake homeowner, two decades ago boating was extremely difficult because the weeds were so thick. At that time 20 years ago, Cygnar and his neighbors would often try to clear a path around their piers so it would be easier to get their boats out. The weeds were so rampant that hours of work would make little difference. In 1991 the Little Green Lake Protection and Rehabilitation District was formed to create and implement protection strategies to improve her health, according to the 2004 Little Green Lake Watershed assessment. Six years later, lake residents’ concerns about excessive plants and algae growth led to the creation of a lake management plan with strategies to address the concerns. The community surrounding Little Green is passionate about her health. A 1997 survey of residents found that her fishing and aesthetic qualities are most important to them. As a result of this, residents agreed her excessive algae and weed growth represent the biggest problems concerning lake use and satisfaction. She began to look healthier in 1992, when the residents of Little Green Lake began installing sediment basins in areas susceptible to high runoff levels around the lake, according to the Watershed Assessment. Retention ponds and sediment basins help slow down the phosphorus by keeping it in the retention pond, Carpenter says. One of the biggest changes she went through began in 2002, when an aeration system was installed to prevent the release of sediment phosphorus forms stored in the bottom of the lake, according to the Watershed Assessment. The system consists of tubes installed in the deepest part of the lake, with an air compressor on shore pumping air into these tubes, according to Aaron Gruenewald, an aquatic and environmental biologist and owner of Natural Resource Group. Gruenewald wrote the Aquatic Plant Management Plan for Little Green Lake that was passed by the DNR in 2011. Cygnar refers to this system as the “bubble machine” and considers its installation one of the biggest improvements of her health. Along with catch basins and retention ponds, Little Green Lake has a “very aggressive” weed harvesting system, which helps to limit the loading of phosphorus, according to Cygnar. Little Green Lake homeowner, Mike Smoot, one of the harvester operators, says the summer of 2014 was a bizarre year for weed cutting. He recalls August being a heavy time for weed growth, especially in the Kearly Bay area where a large farm is located directly across the street. In addition to harvesting, the Little Green community also applies an herbicide application to keep weeds at a more tolerable level for boating and recreation. According to Cygnar, these treatments are mostly used in areas where the harvester cannot reach. The treatment, Cygnar says, kills the weeds at the surface, but it does not keep them from coming back. According to Johnson of the DNR, about 60 to 70 percent of the phosphorus in Little Green Lake is due to farming. In order for any kind of lake management plan to be successful, partnerships need to develop between all aspects of a community. “It’s a combination of local input, not only lake residents, but also farmers in the area, the [DNR], the County Land Conservation Department, the township itself and the federal government,” he says. Little Green Lake is lucky to have such a responsible community who cares deeply about her health. Just as with any sick patient, many people are invested and involved in the treatment process. Thanks to the loving and dedicated community surrounding Little Green Lake, she continues to get healthier each and every year, and the sun continues to shine just a little bit brighter on her waves.